Burundi is a land-locked country in East Africa that was plagued by violence for decades. Although it’s recovering, hunger in the country is still widespread – and WFP is dedicated to delivering lifesaving food assistance and agricultural support to Burundians struggling to create a better life. Here’s 10 facts about Burundi and hunger to help you better understand the challenges and opportunities facing the nation. Burundi has been plagued by conflict for much of the past 26 years. Burundi’s first democratically elected president was assassinated in October of 1993 after only 100 days in office, triggering widespread ethnic violence. More than 200,000 Burundians perished during a civil war that officially ended in 2005. Most people in Burundi don’t have enough to eat. As a result, more than 50% of Burundi’s population is chronically hungry. Agriculture is the backbone of Burundi’s economy. 80% of people in Burundi relying on farming to meet their food and income needs. Even during harvest season when food is most plentiful, households spend up to two-thirds of their income on food. Burundi is one of the “red zone” countries identified by WFP as being among the most affected by soaring food prices. This is mainly the result of inadequate domestic food production. In fact, total food production in Burundi would only cover a person for 55 days out of the year. Burundi is one of the poorest countries in the world. Nearly 75% of its people live below the poverty line. It’s also the most population-dense country in Africa. There is an average of 248 people per square mile and the population is growing rapidly at nearly 3% each year. This reduces the amount of farming land available for food production. Like much of Central Africa, Burundi is prone to natural disasters such as floods, hailstorms, drought and torrential rain. In recent years, the country has registered an unusually high number of natural disasters, which have contributed to the displacement of communities, the destruction of homes, the disruption of livelihoods and the further deterioration of food and nutrition security. WFP has been working in Burundi since 1968. WFP is currently supporting more than 800,000 of Burundi’s most vulnerable families through the rehabilitation of children suffering from malnutrition, the provision of school meals, food assistance to victims of natural disasters, and the empowerment of communities to improve food production. Since April 2015, more 300,000 refugees have fled Burundi due to violence. 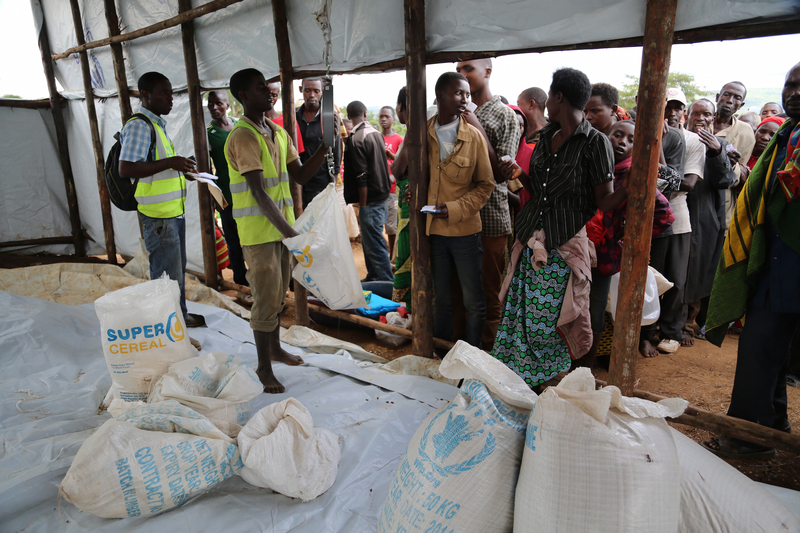 WFP is providing food and nutrition assistance to the refugees who have fled to Rwanda, Tanzania, Uganda and the Democratic Republic of Congo. To support families on the move, High Energy Biscuits are provided along the way. Refugees also receive hot meals in transit centers. Once a family has settled in either a camp or host community, WFP distributes rations including maize, beans, oil, salt and Super Cereal. None of this would be possible without your support. WFP—and its operation in Burundi—is entirely funded by voluntary donations. We need your continued dedication and generosity to reach more families in need as the situation deteriorates.